Visit Santa’s Grotto, tell the man himself what you would like for Christmas and have your picture taken with his Reindeer. Each day from 10.45 – 16.00 at the Cloisters. In order to avoid long queues at the Grotto, a ticketing system will be in place during peak times. Father Christmas will also be going for his lunch at 13.00 – 13.45. After visiting Santa’s Grotto, why not get some refreshments and explore the Christmas Stalls at St Peter’s Community Centre. Check out what’s happening at the Manor Barn with our events programme. Additional children’s craft activities will be taking place throughout the weekend at the BLODS Hall. To round off the weekend, St Peter’s Church is creating a candle lit ‘Living Crib’ procession through the Old Town, finishing at the church. To take part, please make your way to the Manor Gardens for 6pm on Sunday. Fun for little ones with Steve Nutter’s Old Time Funfair, located in the Manor Gardens. Watch out for children’s entertainer Andy Bosco, who will be performing around the Old Town all weekend. Hot food and refreshments will be available throughout the weekend at the Manor Barn and St Peter’s Community Centre. 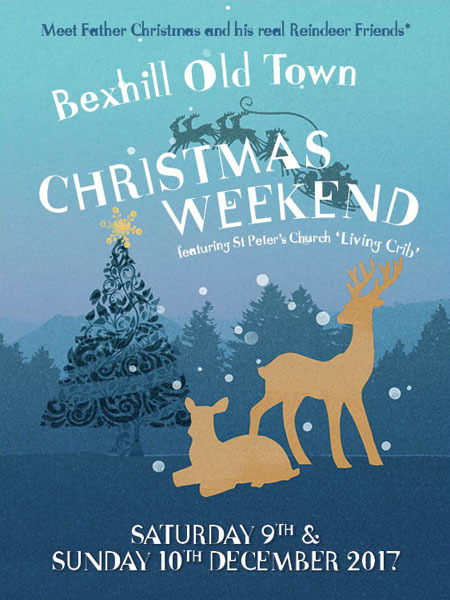 The Christmas Weekend is arranged and sponsored by the Bexhill Old Town Preservation Society and supported by St Peter’s Church. We would like to thank all the volunteers that make this event possible.